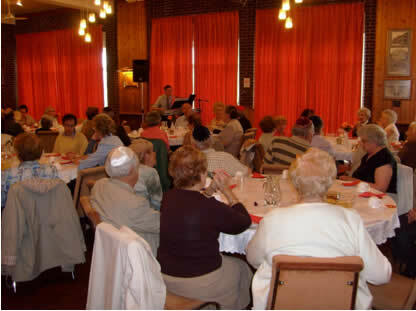 Photo: The Leisure Club being entertained to music & song by Yamaha Keyboard Professional, Martin Hewitt. The Leisure Club members enjoy a friendly, social and welcoming atmosphere. Events typically include musical and entertaining film shows, guest speakers, musical entertainment, presenters and a speaker’s panel. The Club meets alternate Mondays at 2:00pm. Refreshments and a Raffle are included, all for a very minimal charge. Whilst the Club attracts our more senior members, all ages are most welcome. The Club is now in its 29th year (2018). Contact the office for additional information. In the event of possible cancellation due to bad weather, contact the Office or Radio Leeds on 0113 244 2131.